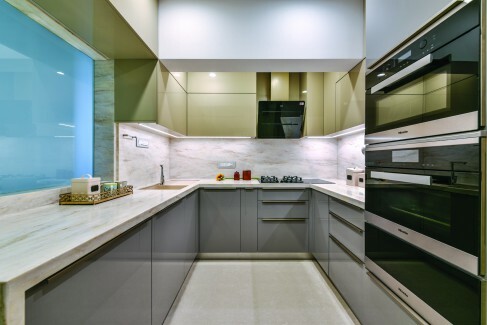 A boutique 3 BHK residence for a family of four at Mumbai’s Cuffe Parade not only gets a swanky makeover by Zed Designs, but also fixes the ‘storage’ problem that almost every housewife faces. The play of colours and textures in the living area are wonderfully offset by the predominant greys. 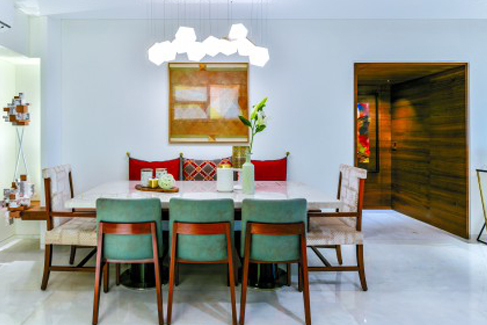 “Elegant simplicity and little chaos is my notion,” says Zenab Lokhandwala of Zed Designs, Mumbai-based design, interiors and lifestyle firm that was tasked with the renovation of a home belonging to the Bhatnagar family at Mumbai’s Cuffe Parade. Sitting down with Home Review, Zenab talks about the home that from the word ‘go’ was all about ‘more storage’. With a molecular abstract light fixture placed right above the dining table, the area is warm and inviting in a colour palette that is both soothing as well as appetising. “The house was first ripped down it’s the bare skeleton in order to carry out the basic structural repair,” Zenab begins. 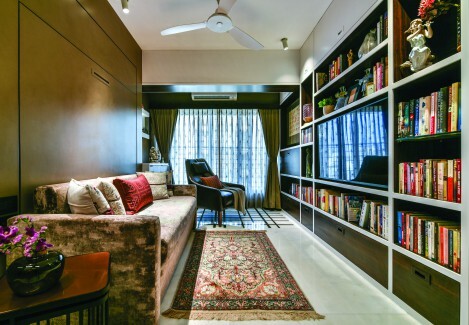 “Given the requirement to plan excess storage spaces within the restricted sizes of the bedrooms and average ceiling height, we incorporated a lot of integrated and concealed storage,” she continues as she talks about the most challenging feature of the Bhatnagars’ home. With the intention of making the heavy furniture appear subtle, inconspicuous at best, large pull-out trolleys have been embedded into walls and thin cabinets for crockery are placed behind large veneer panels; all these were then given final finishing touches to help them blend into the walls. 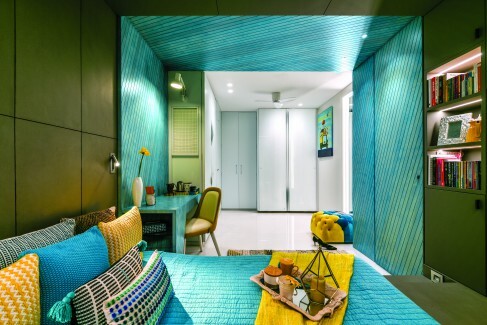 Turquoise and yellow come together to give the children’s bedroom an entirely new and different perspective. The children’s bedroom is spaced out well with the use of the window-side that creates a cosy cocoon and a platform bed that frees up the entire floor for ease of movement. 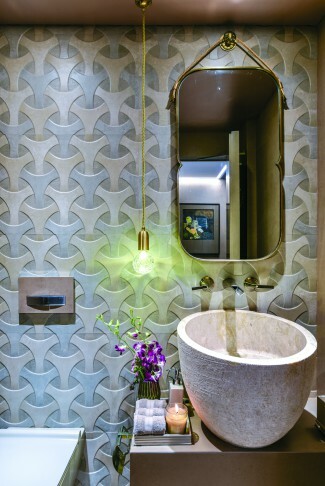 “The layered look with an accent turquoise slatted angular wrap in the centre brings in dynamic elements juxtaposed with large mirrors that add a lot of depth to the room,” Zenab adds. The room also boasts of layers of custom designed patterned Oakwood ceiling and paneled ceiling finished with Polyurethane texture coating. 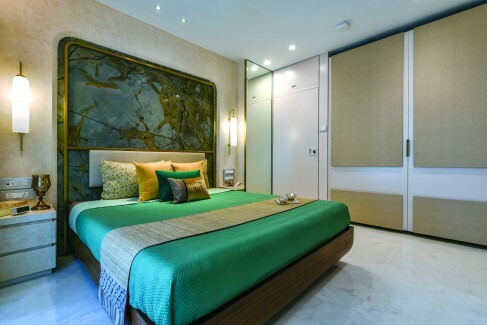 The camouflaged doors with paneling, intricate details on door handles and the special light fixtures give the bedroom a chic and contemporary character. The master bedroom is rich in elegant textures in an ivory-peach colour palette, along with exotic marble highlights on the wall, complemented with brass fixtures. The elements are intricately woven together to give the bedroom a seemingly holistic and contemporary appeal, beautifully brought to life with art deco features. Perhaps the most interesting aspect of the master bedroom is the Savannah blue highlighter marble for the bedside feature wall from Classic Marble Company. “For me, a design is an ever-evolving process intended to provide a solution or to fill a need for people that will ultimately interact with it,” says Zenab, as she elaborates on the features of the living area as well as the guest bedroom. 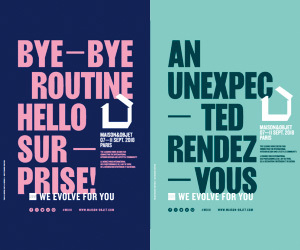 “There are conspicuous interfaces where little details and elements make the statement,” she adds. And this philosophy is blatantly evident in the way the living area has been brought to life. White walls are an integral part of the layout broken only at the vaulted veneer-wrapped door portal which is the entrance to the bedrooms. Our favourite room, the guest bedroom comes with a wall to wall bookshelf, a couch and a hydraulic bed. 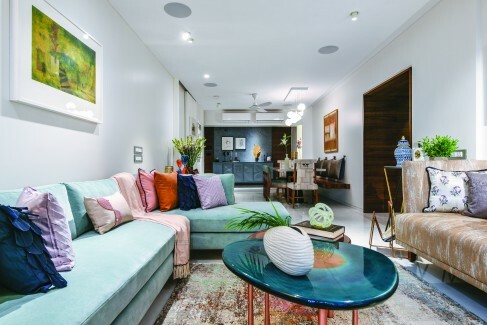 Colourful furnishings, accent light fixtures, carefully sourced and selected art and textiles add a bit of abstract expression and eclectics to the design scheme. 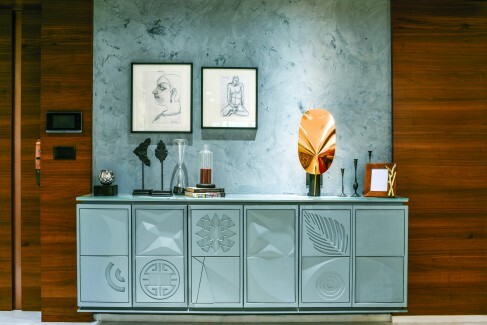 Respite from the burst of colours comes in the form of a rear wall where the grey console with abstract engraved panels in concrete grey tower to the height of the ceiling; offsetting them are veneer panels on either side creating an intentional play of opposites. Designed with the intention of spending maximum time indoors and indulging oneself in reading, quiet reflection, and relaxation, the guest bedroom and its en-suite in warm and earthy tones that immediately spell comfort and home, are entirely different from the typically clinical guest rooms many homes have. The powder room of the guest bedroom is also enhanced with the same warm and earthy tones, and is luxuriously appointed. A large bookshelf in a bespoke design spreading across the entire length of the wall and the accent arm-chair on the patterned floor make for a perfect reading nook in the room. A hydraulic bed unit is installed on the opposite wall. It also works as a couch catering to the Zenab’s philosophy of maximum utility of space. The kitchen was upgraded three folds with an improved layout. Corian counters, wall dados and PU shutters lend a sleek and contemporary look to the modern and fully-equipped modular kitchen by Blum. “Every nook and corner of the house has been utilised to the maximum,” Zenab goes on. Hidden storage spaces and pull-down study ledges have also been incorporated within the large book unit in the guest room. Every piece of furniture is customised to size, specifications, and details, such that it lends a unique character to the space it inhabits. Along with gypboard ceilings in all rooms except the children’s bedroom, laminam surface skins for walls and floors in the bathrooms, and walnut veneer clad doors and panels in the living area, the house also has the celebrated works of artists like M. F. Hussain, Jamini Roy, Akbar Padamsee, and many others; all part of the client’s private collection. A blend of the classic and the modern, contrasts and subtlety, and minimalism with a sense of the abstract, Zenab has given the Bhatnagars’ an abode that is decidedly singular and is a reflection of their individual tastes and styles along with oodles of storage space!